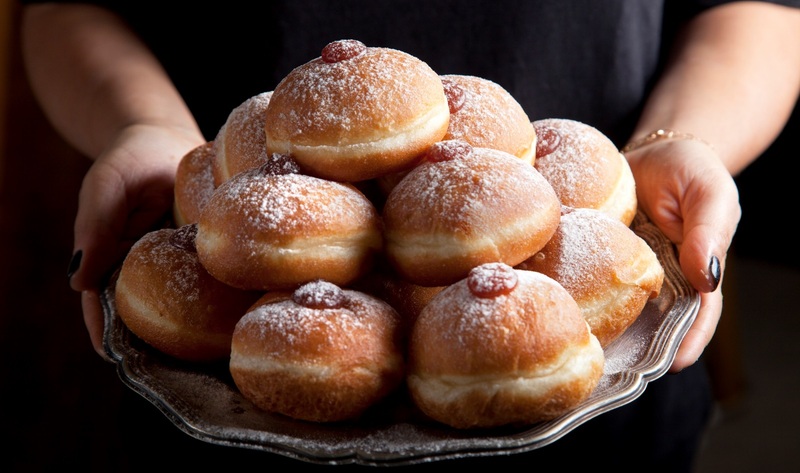 We all love the classic Channukah sufganiya — a light and puffy fried donut made from yeasted enriched dough, filled with red jam and topped with a generous dusting of powdered sugar. There are few greater joys than taking a bite and letting the jam squirt out the other end, while powdered sugar clings to your lips. That is, until you meet the modern Israeli donut. Think of it as the souped-up monster truck version of the original. Each year, Israeli bakeries just keep getting crazier and crazier. 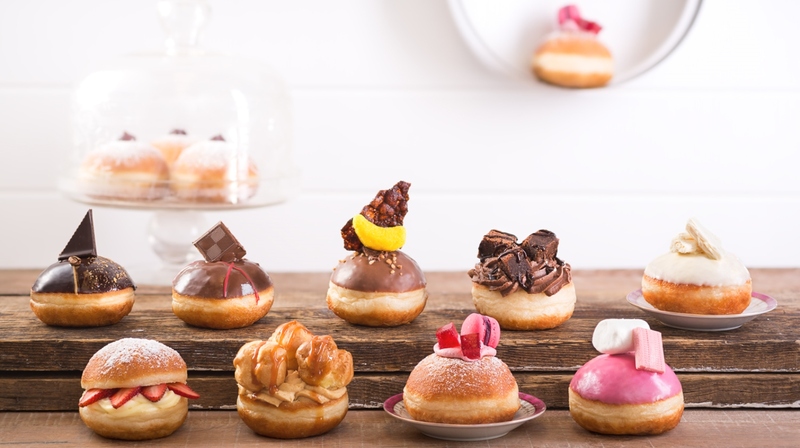 With their creatively delicious fillings, toppings, garnishes and extras, sufganiyot are now meant to be the most decadent treat you’ll eat all year. 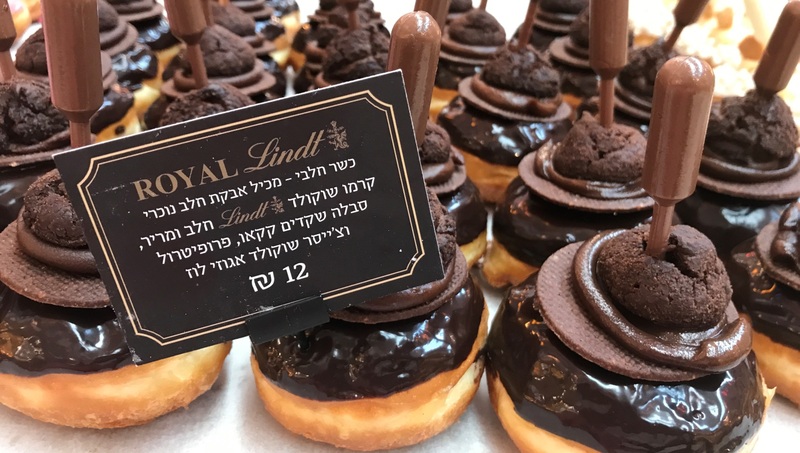 Below are bakeries producing some of Israel’s most exciting sufganiyot, and our favorites among the zany flavor combinations they’re making this Chanukkah. Always a power player in the sufganiyot game, Roladin is revered for its seemingly never-ending selection of flavors and over-the-top presentation, which often includes little syringe “shots” to inject into the center of the donut prior to eating. Because Roladin is a national chain, it’s one of the best options for finding crazy-flavored Hanukkah sufganiyot in smaller cities and suburbs. Baba Au Rhum. Sugar syrup-soaked, topped with whipped cream and a candied cherry. Served with a dark spiced rum shot. Violet Cheesecake. Filled with cheesecake cream, topped with purple and white chocolate glaze, and garnished with violet flakes, whipped cream and fresh blueberries. Royal Lindt. Stuffed with Lindt chocolate cream and garnished with cocoa-dusted almonds, a miniature cream puff, hazelnuts and a chocolate shot. Using only the best ingredients, Miri and Shuki Arazi opened this bakery 20 years ago as a neighborhood coffee shop in the Neve Tzedek neighborhood of Tel Aviv. 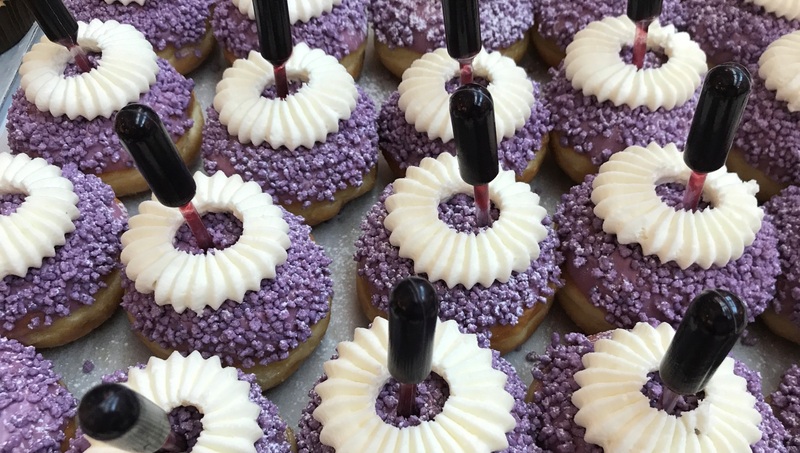 Now at the top of the big city’s pastry game, they have teamed up with the Elite-Strauss brand to bring several collections of sufganiyot to customers this holiday season. 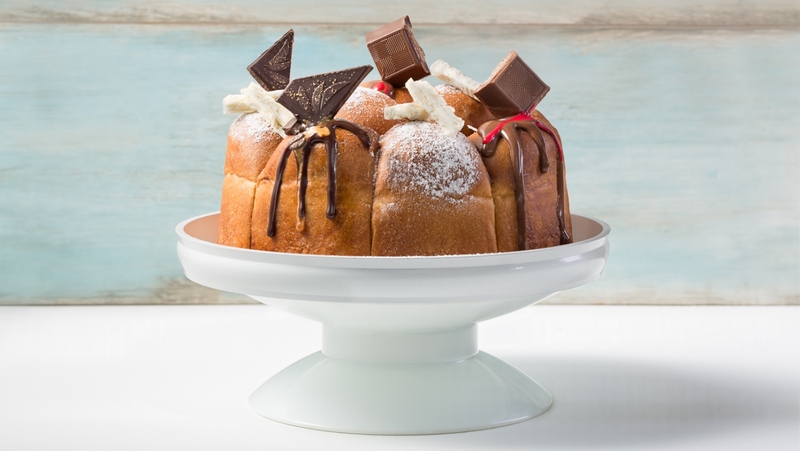 Metuka (“sweetie”) also is known for its sufganiya cake, reimagined each year, and made up of 11 baked brioche rolls filled with three kinds of chocolate cream. Pezek Zman. 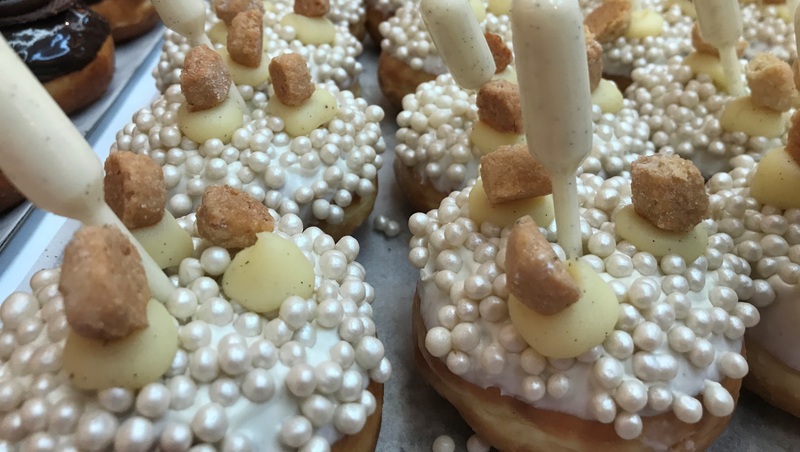 Named after the Israeli candy bar comprised of wafer-encased nougat cream and a chocolate coating, this donut has Pezek Zman-flavored cream filling, ganache topping and chopped pieces of the candy bar as garnish. Chunky. Banana cream filling, chocolate coating, and garnish of hazelnut slices, chocolate tuile and banana candy. Vegan Sfinge. Moroccan-inspired Hanukkah donut similar to fried dough, sweetened with date honey and rolled in granulated sugar while warm. 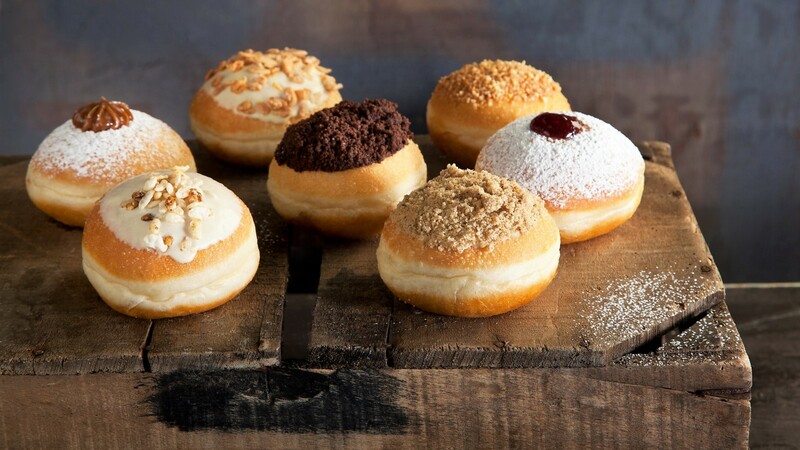 Among Israel’s first and most successful bakery chains, Haifa-based Shany creates new flavors for its famous sufganiyot each year. The 2018 line honors some of the pastry world’s most iconic sweets by borrowing classic flavor combinations and applying them to the usual yeasted sufgania. Also on offer are new-age classics such as pistachio cream, alongside specialty flavors and an irresistible classic jam donut. Brownie Cheesecake. Cheesecake cream filling, topped with chocolate ganache and a mound of edible glitter-dusted brownie bits. Lemon Pie. Lemon curd filling with a touch of Mediterranean spearmint, topped with a mountain of piped toasted merengue. Pink to the Core. Bazooka bubblegum cream filling, light pink white chocolate coating and pink candy floss garnish. Dan Kelly, the Paris-trained pastry chef of Nomili, creates high-quality products using only top-notch ingredients, and this also applies to the sufganiyot he’s creating this year. Made with the sourdough starter Kelly has been cultivating for years, and other simple culinary pleasures like Madagascar vanilla and Belgian chocolate, these are some next-level sufganiyot. Caramel Milk Chocolate. Filled with caramel and milk chocolate ganache, topped with a chocolate glaze and garnished with puffed rice and caramel apple. Belgian Chocolate. Filled with Belgian chocolate ganache, topped with a ganache glaze and garnished with chocolate butter cookie crumbs. 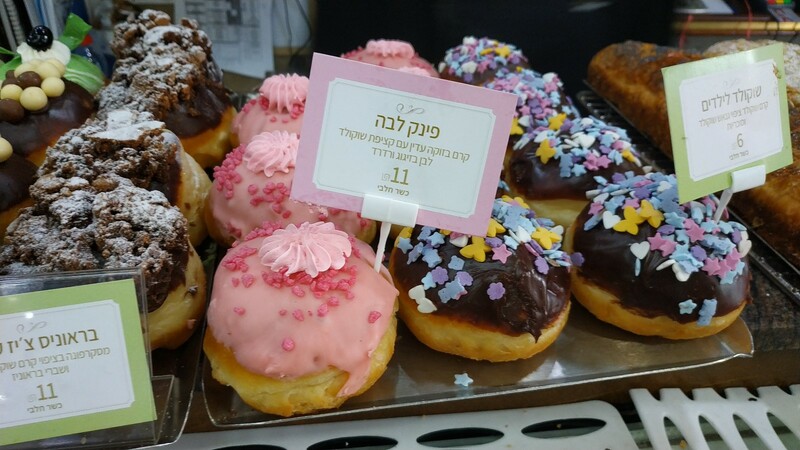 Taking a grown-up approach to the holiday, Pat BaMelach bakery in Gush Etzion is selling baked sufganiyot this year. Known for its unbeatable sourdough bread, the bakery — which also offers Hanukkah-themed workshops for all ages — adds high-quality olive oil to its sufganiya dough to commemorate the holiday. Strawberry Jam, Dulce de Lecheand Mascarpone Cream available in white and milk chocolate. This boutique bakery-café is where locals flock for a taste of authentic European-style pastries in Israel. 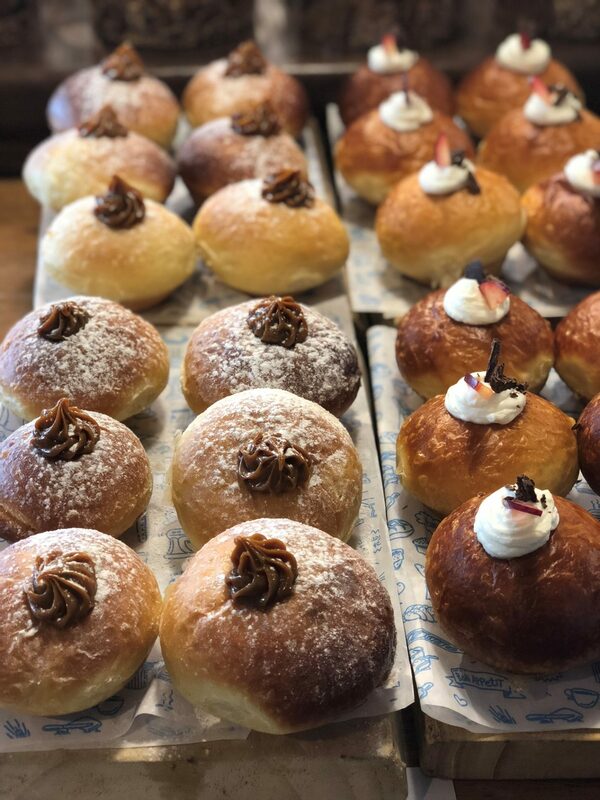 Run by pastry chef Eran Borkin, and beloved for more than just the delicious breads the name (lechem) suggests, Lechem Borkin offer a host of delicious sufganiyot for Hanukkah. Ferrero Rocher. Topped with chocolate and hazelnut cream, and a slightly unwrapped Ferrero Rocher truffle candy. Cinnamon-Halva. Filled with halva cream, glazed with white chocolate ganache, topped with shredded halva candy and roasted pistachios, and garnished with a cinnamon stick. Cake Donut Holes. 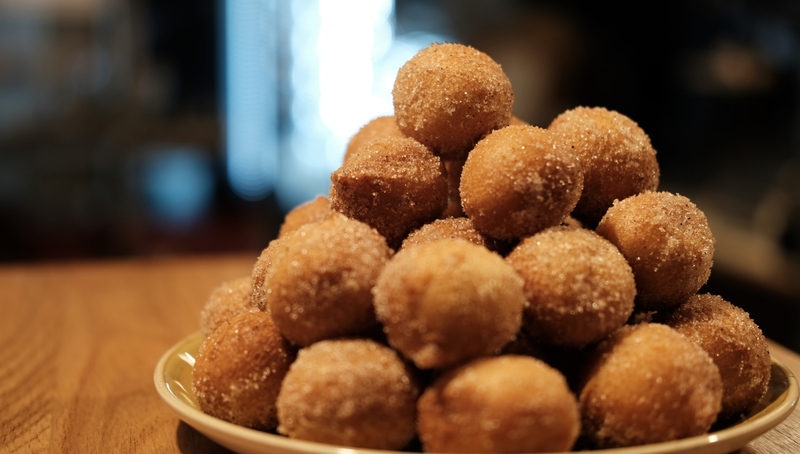 American-style donut holes, available rolled in cinnamon and sugar, or filled with strawberry jam. 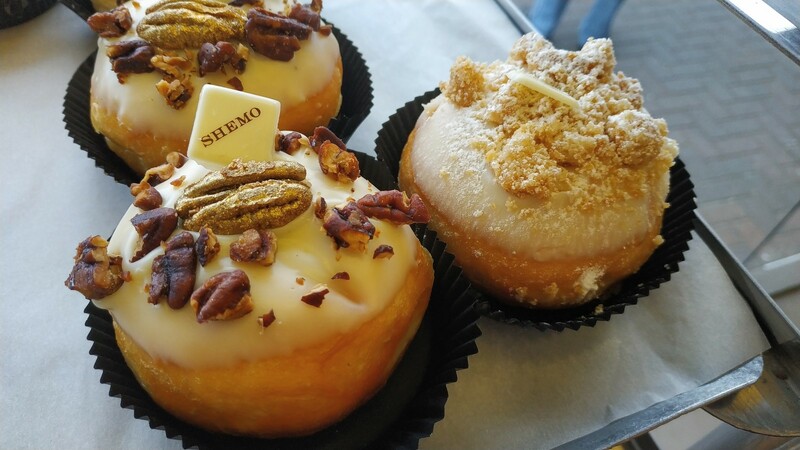 Started by the Shemo family in 1992, and now run by the family’s celebrity pastry chef Miki Shemo, this bakery embraces the trend of over-the-top sufganiyot with wild flavors, garnishes, toppings and flavor shot injectors. Stawberry-Vanilla Sandwich. Cut open like a sandwich, filled with vanilla pastry cream and topped with fresh strawberries. The Hedgehog. Topped with piped spikes of dark chocolate truffle. Pecan. Filled with vanilla pastry cream, topped with white chocolate ganache, and garnished with chopped candied pecans and one golden edible glitter-painted whole pecan. 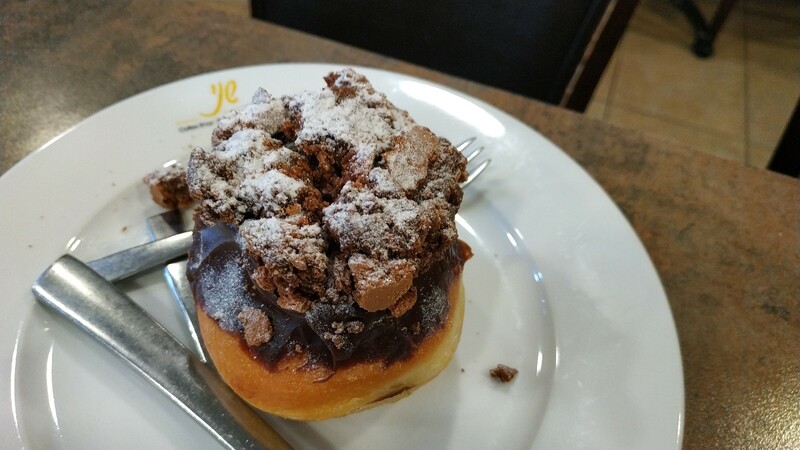 The three sufganiya flavors at Lehamim may be tame compared to competitors, but when your head pastry chef is the famed Uri Scheft, there’s no need to get unnecessarily fancy. These donuts are made to perfection by professionals. Real-Fruit Strawberry Confiture, Belgian Chocolate Ganache and Dulce de Leche.